You are here: Home » MEDIA » Comics » Comic Book Creator #15 Summer 2017 (magazine review). 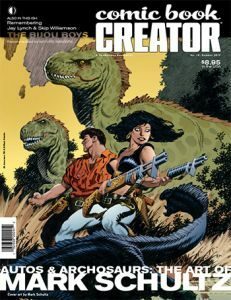 Comic Book Creator #15 Summer 2017 (magazine review). I think the biggest shock in reading the latest edition of ‘Comic Book Creator was in Jon Cooke’s editorial that Bernie Wrightson died in March and Rich Buckler in May. Both solid comicbook artists in different ways and likely to be both missed by us older fans. Cooke has promised more in later issues. For the start of this issue, there’s a 24 page look at the recently departed underground comics creators Jay Lynch (1945-2017) and Skip Williamson (1944-217), creators of the ‘Bijou Funnies’ comix, who died within 11 days of each other. Although I never had much interest in that side of the comicbook market, reading this piece also gives insight into its history as well as them. I ran a cursory google glance at other underground comix legends and had a sharp reminder that none of them are getting any younger. The 48 or so pages extensive interview with artist/writer Mark Schulz. Although I never got around to reading his ‘Xenozoic Tales’, I have heard of his ‘Cadillacs And Dinosaurs’ as printed by Marvel before I left my comicbook reading. Jon Cooke’s interview is extensive, looking at Schulz’ roots and how he developed his interest in comics and art, often showing a lot of examples from others. We also read the same book, ‘The How And Why Wonder Book Of Dinosaurs’ when young. I wonder how many of our generation were influenced by that book? As ever, ‘Comic Book Creators’ is an extensive read and even if you’re not familiar with the people, you get a look into their mindsets and what makes them tick. « Reel Vulnerability by Sarah Hagelin (book review).